All the Best Things Come in Blue! 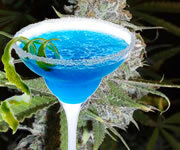 Blue ribbons are awesome … Blue moons are way-cool … but Blue Strains are the absolute sh*t! If you crave intense fruit flavour, couch-locking smoke & shockingly bright colours, grab one of these awesome cannabis seeds today & discover total, utter & complete satisfaction. Add a Little Colour to Your Life with Super-Cheap Blue Strains! In a Cold Climate? This Seed's for You! Blueberry Gum is a hardy Indica with thick resin, extra-high yields & the strength to thrive in cold, mountainous regions. In fact, she prefers it! Cold Nights Bring Out the Purple! 22% THC, 750 gr/m2, As Fast As 6 Weeks! With finishes as short as 6 weeks, BBBT's crystals will form right before your very eyes once you flip. Best of all, they're easy as f*ck! Delhi Friend Gets a Blueberry Makeover! Redefining the Meaning of Intensity! Extreme doesn't even begin to describe the concentrated Blueberry flavour or the rockin' highs that'll lift you up, lay you low & do absolutely everything in between. Auto Blue is a robust automatic that packs a massive punch. The intense flavour will really hit the spot & so will the incredible power. This is not your standard AutoFem! Auto Blue Diesel is Fueled Up & Ready to Roll! This big rig comes fully loaded with 16% THC, rich aromas & enough berry-infused flavour to satisfy the most demanding palate - and she crosses the finish line in just 65 days! Next to Yellow, Blue is The Gorilla's Favourite Colour! And how can you blame him? The Blue Family, headed up by the epic & legendary Original Blueberry, is one of the most productive, flavour-packed & potent groups of cannabis seeds on the planet bar none. The Gorilla loves these wicked-good Blue Strains - and so will you! One of the Most In-Demand Lines Ever! DJ Short & Dutch Passion got the ball rolling back in the day, but this old-school powerhouse has been amped up, ramped up & completely made over too many times to count. Today, you can get authentic Blue genetics mixed with just about any other cannabis seed you can imagine including fully autoflowering Blue Treacle Automatic. Go Blue Without Breaking the Bank - Buy Blue Strains from The Gorilla Today!